The Paraguay Flag features three horizontal bands in the colors of red, white, and blue. On one side of the flag, the national coat of arms is featured in the middle of the white band and on the other side of the flag, the seal of treasury is featured in the middle of the white band. 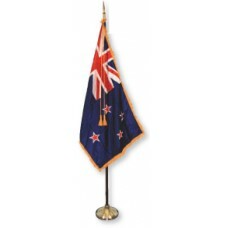 It is one of three national flags that are different on each side. The colors of the Paraguay flag were inspired from the French Tricolor and represent the country’s peace, independence, and liberty as well as the battle that was fought and bloodshed in the fight for independence. The national coat of arms is an illustration of a yellow 5-pointed star that is surrounded by a green wreath of palm and olive leaves. The words "REPUBLICA DEL PARAGUAY" (Republic of Paraguay) are written around the wreath. The coat of arms represents Paraguay’s fight for independence. The Seal of Treasury on the other side features a yellow lion (which represents courage) below a red Phrygian cap with the words "PAZ Y JUSTICIA" (peace and justice). The seal of treasury represents liberty, peace, and justice. 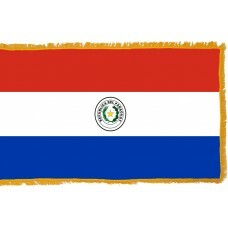 The Paraguay flag was adopted in 1842. 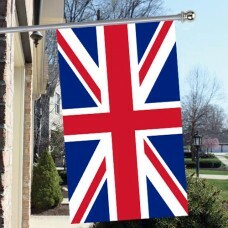 Since gaining independence in 1811, the flag has been changed numerous times until it remained as the one that it is today. Paraguay is a landlocked country in South America that shares borders with Bolivia, Brazil, and Argentina. It is often referred to as "Corazon De America," which translates as "The Heart of America." It is called this due to it being very central in the South America continent. The capital and largest city of Paraguay as well as one of the oldest cities in South America is called Asuncion City, also known as the "mother of all citie"’ as it was used as a central base by the Spanish during the 16th century. The country of Paraguay is divided by the Paraguay River (the second largest river in South America, following the Amazon River) into two regions. The first inhabitants of Paraguay were the Native Guarana people. The first European explorers reached Paraguay in 1516. In 1537, the Spanish explorer, Juan De Salazar established the capital, Asuncion City, many settlements were made and Paraguay became a Spanish colony. On May 11th, 1811, the people of Paraguay revolted against the Spanish and on May 14th, 1811, Paraguay was declared independent. Following its independence, for 60 years, Paraguay was ruled just by dictators and, as a result of the conflict and corruption in government, Paraguay lost a lot of land and 70% of the male population in the "War of the Triple Alliance" between Brazil, Argentina, and Uruguay in 1865-1870. The economy in Paraguay is dominated by agriculture. Despite some of the beautiful sights that it is home to, Paraguay is the least visited country in South America and one of the main attractions people visit is for the "Festival De San Juan," the colorful festival that occurs every June and celebrates the arrival of summer solstice. Where union and equality reign. "Enough! ", it said, and broke the scepter. Was covered by an angel with its wings. Sweet Fatherland, in this manner you show yourself. Of sapphire, diamond, and ruby. Under the cap, one sees the lion. And of glories, the memory and crest. Sound the cry, "Republic or death"! Will sustain its heroism in the fight. And an abyss divides the two. For the free, renowned glory! For the Fatherland, immortal laurel!